WARNING: Mild spoilers follow for the plot of The Amazing Spider-Man 2. I wasn't a fan of the first Amazing Spider-Man film when it came out two years ago. 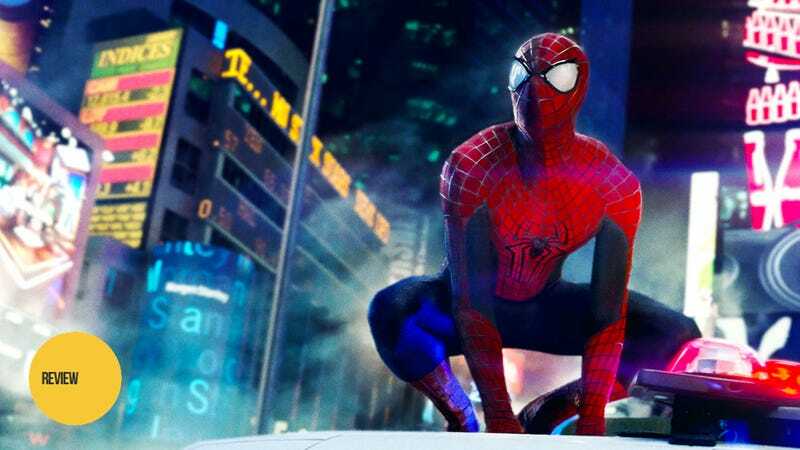 Director Marc Webb's initial take on Marvel Comics' renowned superhero didn't justify its existence as a reboot. It retold an origin that didn't need retelling. Spider-Man doesn't need that kind of narrative architecture. Peter Parker's a character that's best realized in the swirl of the present. Yes, his catalyst moment is in a past mistake where he used his powers to look out for number one and lost his beloved Uncle Ben because of it. But, Spider-Man works because he's always figured out a way to move forward, out of guilt and circumstance. Plotlines where he's had to dig out his past—especially the ones regarding the actions of others, like the Clone Saga, for example—have felt like they weighed the character down. Webb makes the most of the talents of his young cast in ASM2. Dane DeHaan does a good turn as Peter's frenemy Harry Osborn. Though all audiences get is a few quick scenes between Peter and Harry to serve as shorthand for their friendship, the breeziness between Garfield and DeHaan does enough to intimate a long-ago warmth once existed between their characters. DeHaan simmers more than he shouts and sketches out a Harry whose neglected-child wounds add a tiny bit of sympathy to his mania. He's fun to watch. However, as in the previous film, the chemistry between Andrew Garfield's Peter Parker and Emma Stone's Gwen Stacy is ASM2's biggest highlight. The banter and heartache between the two leads gives the movie an adorable emotional center of gravity, one that glosses over plot holes and the hamminess of Jamie Foxx's turn as Electro. The take on Spidey's electrical supervillain in ASM2 continues the b-movie allusions from its predecessor, with a few moments that dance over the border into campiness. Though touches like a sadistic German-accented mad scientist feel like tonal self-indulgence, none of that breaks the tenor of the what-are-we-doing-with-our-lives proceedings. There's a better emotional core inside Webb's second go-round with the wall-crawler. Spider-Man feels like a part of this fictional New York City and his chatter with bad guys and ordinary folk alike captures part of why he's been a favorite character for so long. The three main characters find themselves at a crossroads, with life getting turbulent as they get older. The interdependency between hero and villain that's become a tiresome requirement in cinematic superhero adaptations is still here in ASM2 but it's better executed here than in, say, Man of Steel. There's a superior balance of angst and charm in this film, including a great sequence early on where Spider-Man saves multiple lives in rapid-fire fashion. The needs that Gwen, Peter and Harry are trying to fulfill feel genuine, despite the hard-to-believe coincidences that the plot walks their characters through.